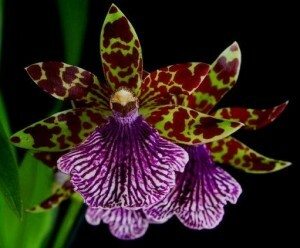 The Zygopetalum (zye-go-PET-ah-lum) orchid genus is very small and only contains 15 recognized species. Even though the number of species is small, there are an abundant number of Zygopetalum hybrids. Zygopetalums are very fragrant orchids and their fragrance can often fill an entire room. Zygopetalum orchids produce beautiful waxy-looking blooms. The blooms are usually green and brown striped or speckled, with a broad white velvety lip marked with purple, indigo, maroon, or fuchsia. The leaves are long, glossy, and strap-like. Zygopetalum foliage can grow to be nearly two feet tall and the inflorescence, which develops from the base of the pseudobulb, will usually grow even taller than the leaves. Zygopetalums are very specific in the type of care and requirements they need, however, if you have a bit of experience in caring for orchids you may want to try your hand at growing a beautiful Zygopetalum orchid. Watering frequency – as covered in this article about watering orchids – can be determined by a few different things. It is very important to not let Zygopetalum orchids dry out completely between waterings. While the orchid is in active growth, during the warmer months, you will want to water more frequently (approximately once a week), and less frequently in the cooler months when the orchid is not in active growth. As covered in this article about orchids care and light, Zygopetalums need bright but indirect light intensity in order to thrive. If your orchid is receiving the optimal amount of light the leaves will be a yellowish green color. Too little light will cause the leaves to become a very dark green color and may cause the plant to not produce blooms. The best place to grow you Zygopetalum orchid indoors in on a shaded south facing window although an east facing windowsill will also work as long as the orchid doesn’t receive direct sunlight. As discussed in this orchid plant care article on temperature, Zygopetalums require cool to intermediate range temperatures. The ideal daytime temperatures to grow your Zygopetalum orchid is between 70°F to 80°F (21.1°C to 26.6°C), and night temperatures are between 50°F and 60°F (10°C to 15.6°C). Growing Zygopetalums outdoors is not recommended if you live in an area that experiences warm nighttime temperatures. Zygopetalum orchids are able to survive in temperatures up to 85°F (29.4°C ), although they will need more frequent watering in order to ensure that they do not completely dry out. Extended exposure to both hot and cold temperatures (beyond the ideal ranges) can cause disease and bloom damage. As covered in this “humidity” article on how to care for orchids, Zygopetalum orchids require humidity levels of 40-60 percent. The higher the temperature is the higher to humidity should be. You can easily measure the amount of humidity in your orchids growing environment to determine if you need to increase the humidity. If you need to increase the humidity level in your orchids growing environment you can do so by placing your orchid on a humidity tray, placing a humidifier close by the orchid, or setting the orchid’s pot on top of a tray filled with water and pebbles although it is important that your orchid’s roots do not directly sit in the water. Remember, if you have high humidity levels, it is equally important to maintain proper air movement to prevent orchid disease from developing. If black spots appear on the leaves of your Zygopetalum, this is an indication that you need more air circulation. An easy way to increase the air movement for your plant is by putting an oscillating fan nearby your orchid. Zygopetalum orchids should be fertilized every other watering with a half-strength solution when the orchid is in active growth. When the orchid is not in active growth fertilizing one time a month is sufficient. Remember to only fertilize your orchid when the potting medium is damp. Never fertilize a dry orchid because this can cause major root damage. If you notice that the tips of your Zygopetalum are beginning to turn black, this is an indication that there is too much fertilizer buildup. It is important to flush out any excess fertilizer (once a month) so that the excess does not do damage to the plant’s roots or leaves. Zygopetalum orchids should be repotted once every year or two or once the potting medium remains soggy and no longer drains properly or if the orchid is beginning to outgrow the pot. A good potting mixture for Zygopetalum orchids is a mixture of bark, coconut chips, and perlite. Before repotting your orchid, you should trim away any damaged or rotting roots with a sterile cutting tool. Although the roots are thick, be careful with the roots because they can easily break off. Zygopetalum orchids can be divided as long as you have at least three pseudobulbs per division. You can then pot each division in an individual pot with fresh potting medium. #1 – More Free Zygopetalum Tips! If you’d like to learn everything you need to know about Zygopetalum orchid care (and caring for ALL types of orchids) we also have something called the Orchids Made Easy Green Thumb Club.